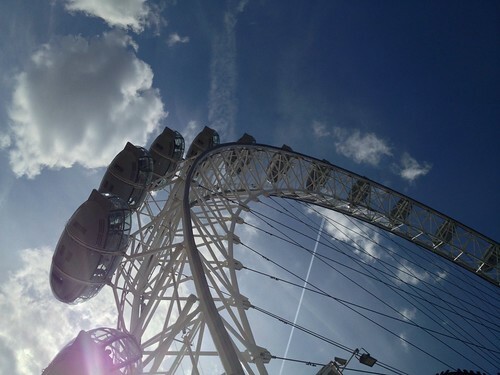 Above Photo: The London Eye contains an intricate network of people, in capsules, networked in a wheel, delicately suspended above the ground in equilibrium. As companies connect to crowds, they too, must balance people and process. How can corporations learn from Uber, oDesk, Lyft, and ModCloth, to enhance their business functions, like the Supply Chain? Let’s explore that question in this Q&A. Welcome to the new Collaborative Economy Expert Series, where I interview leading thinkers from various business functions regarding the impact of this concept across entire corporations. Right now, the crowd is getting what it wants from each other. People are using social media to talk to each other. They crowd is using sharing startups like Airbnb, Uber, and Deliv.com, to deliver goods and each other’s services to their peers. They’re also starting to build their own products and services in the maker’s movement. In each of these cases, the crowd is becoming more empowered and enabled to get what they want from each other. To adapt to these market changes, corporations must adopt the Collaborative Economy, where customers are integrated into every business unit, from marketing, to sales, to innovation . One area that requires more explanation is how product components are sourced, assembled, and then delivered to each other. This area of supply chain is a focus of my former business partner and close friend, Lora Cecere (twitter), who has started a research firm called Supply Chain Insights that is focused on this topic. She recently allowed me to pose a few questions to her on the subject. I want to bring this to the Web Strategy audience, as these upcoming changes will cross many product lines in your company. The better we reason together, the stronger we’ll all eventually be. In Sept, I’ll be speaking at Lora’s conference to Supply Chain experts on the Collaborative Economy, and we’ll both drive new ideas and business models with attendees at the Supply Chain Global Summit. For new readers, read the research report, the collaborative economy, to find out how people are getting what they need from each other –rather than from traditional business models. Jeremiah of Web Strategy: Where are we on the evolution of the intersection of social and collaboration with supply chain processes? Lora, of Supply Chain Insights: The average CEO at the typical company is scratching his head. Corporate growth is slowing, supply chain complexity is increasing and most companies are unable to improve operating margins, inventory or working capital cycles. The marketing-driven programs used to shape demand in the last decade have become less and less effective. The rise of mobility, social and ecommerce capabilities offer promise to redefine business models, but most organizations are stuck in an archaic business model. Meanwhile the CEO is trying to sort hype from reality. The answers are not easily discovered. In most organizations, social data is entering the marketing functional domain, but is not shared with the larger organization. Companies are so used to broadcasting and controlling their message, it is hard for them to move from inside-out thinking to outside-in thinking, a scenario where companies listen, test and learn, based on market signals. There seems to be no place to integrate social data into traditional supply chain architectures. Jeremiah: We see the crowd using tools like Uber, Lyft, oDesk and Airbnb to activate idle resources, how does this tie to existing models? Is this really new? Lora: An interesting example of the Collaborative Economy is Performance-Based Logistics (PBL) in the Aerospace and Defense industry. In this supply chain, global governments had a problem. The cost of an airplane and its subsequent maintenance costs were increasing and outpacing budgetary constraints. So a new business model was proposed to the major assemblers of airplanes. It started when the US Army, Air Force and Navy asked if they could move from purchasing airplanes to purchasing “time” on the plane and paying for “up-time.” An analogy in the consumer supply chain would be shifting from selling cars to offering rental car services. The major aircraft providers started adapting their processes. A new business model emerged that has been adopted by NATO. This was a shift in performance-based outcome that changed the production of aircraft from a “cheaper design” to a “built-to-last” mentality. Jeremiah: Interesting, Performance-Based Logistics (PBL) isn’t too different than some of the activation of idle inventory that we’re seeing in the car-sharing space such as Uber (idle town cars and even ice cream trucks), oDesk (idle workers who can be hired on demand, as needed), and Flightcar, which rents idle cars parked in the long-term lots at major airports. The aircraft illustration parallels something in my last research report. We also found that consumers also want products that are “built-to-last,” as this will impact ability to rent and resell in secondary and tertiary markets. Jeremiah: How do you see the role of the crowd being involved in supply chain? Are there any examples of this already happening? Lora: This is a great question. There’s a gap between what is currently happening and the untapped potential, leaving opportunity for first movers. Let me start with where crowd involvement is driving differentiation. Then, I will close with my thoughts on the future potential of how the crowd could drive and differentiate future supply chains. Apparel and Crowd Sourcing of Design (Modcloth): An early example of the successful use of the voice of the crowd was in the development of customized assortment and input on apparel design. The best example is Modcloth. The company was founded in 2002 and has just recently hit $100M in revenue. Hallmark’s Use of Crowds to Better Understand Humor: I love Hallmark’s use of social to understand humor and to customize the launch of card programs for demographic regions based submitted card programs. This has allowed Hallmark to streamline card development and assortment based on a more insightful program based on social input. Test and Learn Strategies: A beginning step for many companies is the use of test-and-learn strategies. As ecommerce sales grow for consumer packaged goods companies, those companies are able to use rating and review data from online sales as an early indicator of product success to adapt the launch of those products into traditional channels based on customer feedback. The feedback from ecommerce sales is received within days and weeks, while feedback from conventional channels takes weeks and months. Jeremiah: What are the top entry points for supply chain professionals to work with the crowd, either in social media or beyond? Lora: The first step for the supply chain professional is to walk across the hallway and establish a discussion with their digital marketing team (often a sub-group within marketing) and begin to ask the questions about how social technologies could be used to sense demand, shape product offerings and drive new business models. They need to brainstorm “what could be” as though starting with a blank sheet of paper, leaving archaic, preexisting thinking out of the discussion. The potential is very promising, but if organizations cannot break out of working deep within their existing silos, they will be unable to unleash the potential. Jeremiah: In the new space, the Collaborative Economy, we are seeing startups that are enabling the crowd to get what they want from each other. Startups like Deliv.co, DeliveryCrowd, Nearbors and Taskrabbit enable the crowd to deliver products to each other. What impact does this have on supply chain? Lora: was in South Africa last month and heard a fascinating presentation on mobility in Africa. The race is among consumer products companies to successfully build distribution channels into countries in Africa where the average wage rates are low. The presentation was on the use of a mobile application for farmers. The design was to enable collaborative economy model for the sharing of expensive assets for farming. The mobile-enabled co-op allowed farmers to jointly own expensive farm equipment and share maintenance costs. The application also enables the sharing of information about product usage and crop yield. Avon and Amway, with their use of in-home sales channels, were early forms of the Collaborative Economy. As consumer products companies adapt channel models for the African economy, they are aggressively considering the use of collaborative economy concepts in the design of the channel. Mobile wallets, sales from home, and the sharing of inventory investments are key considerations. Jeremiah: What do you forecast as the future of the Collaborative Economy and supply chains going forward? Where can we learn more? Lora: Just as Amazon used ecommerce to successfully build a new business model, I think that there will be new players who will seize the potential of the collaborative economy. Economics is driving it, but the barriers within the traditional organizations are going hinder companies from easily seizing the opportunity. It takes a whole new mindset with a “blank sheet of paper.” Having a blank sheet of paper does not mean using it to write down the same, worn-out concepts. We will be talking about the emergence of new technologies and the evolution of new business models at the Supply Chain Insights Global Summit on September 11th and 12th. I am pleased that you are a speaker. I would encourage companies to visit our website and register for the event. Visit our website at Supply Chain Insights for more information. I’d like to thank Lora for her time in answering these questions. If you’ve further comments, questions, or reactions, please leave a comment. Also, what type of other experts do you think should be on this Q&A Expert series? I’m considering legal, regulatory, economic, and city-level topics are in order.